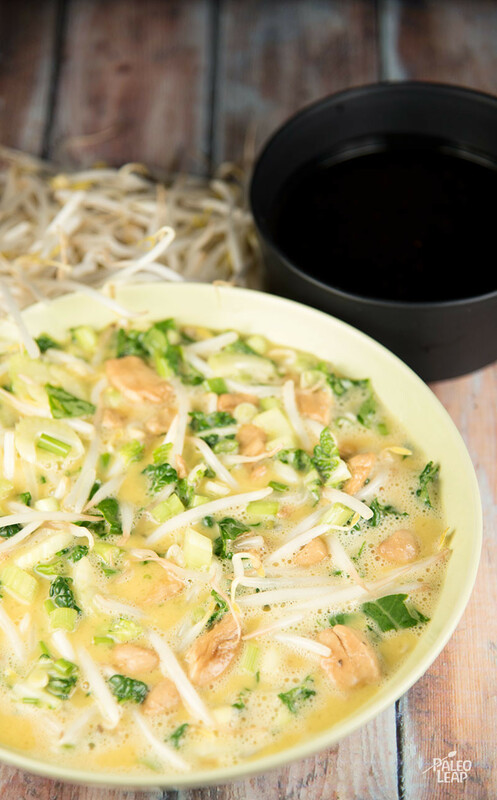 In a large bowl, combine the eggs, bean sprouts, celery, cabbage, scallions, coconut aminos, and chicken. Give everything a good stir until well blended. Pour all the ingredients for the sauce in a saucepan, season to taste, and cook over a medium heat for 5 to 6 minutes. (Optional) In a bowl, combine some water with the tapioca starch and pour in with the sauce, stirring constantly, until the sauce thickens to your preference. Heat some coconut oil in a skillet over a medium-high heat. Pour the egg mixture into the skillet, ⅓ cup at a time, and fry as you would with a pancake, until brown on both sides. Repeat the process until all the mixture is used. Drizzle the sauce over egg foo young, garnish with more scallions, if desired, and serve.